A UN human rights envoy says severe shortages of food, water and medical care for Rohingya Muslims in western Myanmar are part of a long history of persecution against the religious minority that could amount to “crimes against humanity”.Tomás Ojea Quintana’s statement follows the evacuation of hundreds of international humanitarian workers from Rakhine state, home to almost all the country’s 1.3m Rohingya Muslims, tens of thousands of whom are living in crowded displacement camps. 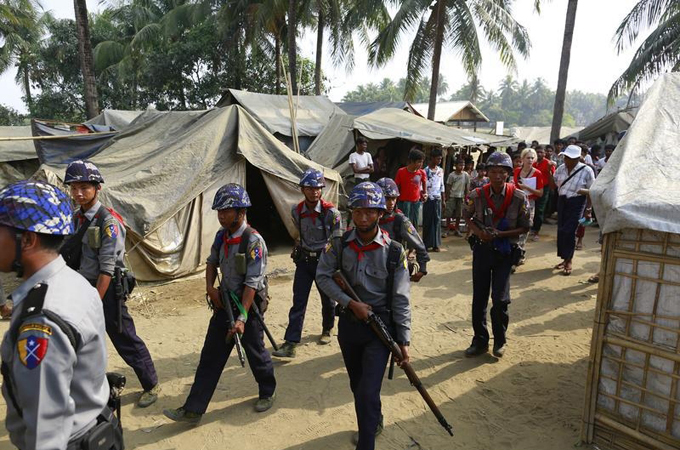 The aid workers left after Buddhist mobs attacked their offices and residences two weeks ago. Some have tried to return, but have been barred by the government. Quintana, the UN special rapporteur on Human Rights, said the developments in Rakhine were the latest in a “long history of discrimination and persecution against the Rohingya Muslim community which could amount to crimes against humanity”. More than 170 aid workers were pulled out of the state as a result of last month’s unrest, the first time they have been forced to leave en masse, and there are fears that the entire relief infrastructure has been severely damaged. The exodus has deepened an already dire health situation for hundreds of thousands reliant on international medical relief, with some 140,000 in the camps, as well as more than 700,000 vulnerable people in isolated villages severely affected. Tensions have been heightened by Myanmar’s recent census, the first in three decades, which has stoked anger among Buddhists that it might lead to official recognition for the Rohingya Muslims, a religious minority viewed by the authorities as illegal immigrants from Bangladesh. Quintana said the government’s decision not to allow Rohingya Muslims to register their ethnicity in the March census meant that the population tally was not in accordance with international standards. The outspoken envoy, who is approaching the end of his six-year tenure, urged the government to address “systematic discrimination and marginalisation” of the Rohingya Muslims in his final report on the country. British Foreign Minister Hugo Swire tweeted Monday that he had summoned the Myanmar ambassador “to register our deep concern about humanitarian access and conduct of census in Rakhine”.